Preheat the broiler. Roast the Anaheim chili and Jalapeno until blackened. Place the chilies in a bowl and cover with a microwave safe saran wrap. Let it stand for 15 minutes. Peel of the skin and discard the seeds and finely dice. Using a large, sharp knife carefully cut the kernels off the corncobs. 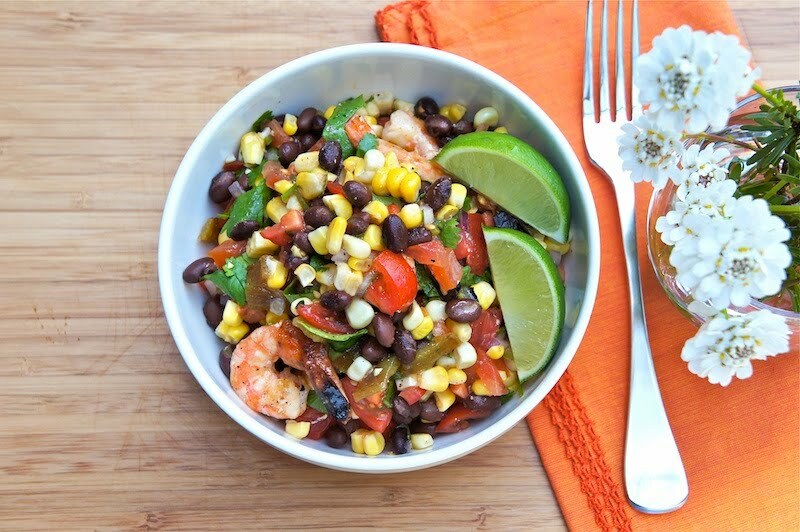 In a large bowl, combine chilies, corn kernels, black beans, tomatoes, onion, scallions, and coriander. Season the salsa with lime juice, sea salt and pepper. Refrigerate the salsa mixture until ready to serve. Optional: In a large bowl, mix the shrimps with chili flakes, sea salt and black pepper, and olive oil. Heat the grill on high and grill the shrimps for about 2 to 3 minutes per side. I like your black bean salsa with chillies, corn and tomatoes. It looks very easy to prepare. This salsa has so many ingredients I LOVE. I'll definitely be trying it. Thanks for sharing! Organic chips and this...would be the perfect marriage! Thanks for sharing...you have my head spinning with ideas! This looks so fresh. And a great salad to take to work for lunches. I have somehow managed to stockpile 8 lbs of frozen shrimp based on this morning's inventory. I can use all the fresh, delicious salad ideas I can get! just beautiful. another incidence of sheer genius!